New York -- Swann Galleries’ Tuesday, April 16 auction of Printed & Manuscript Americana features a robust selection of Mexican imprints and manuscripts, state material and items relating to the Civil War and President Lincoln. Mexican material forms the cornerstone of an extensive section of Latin Americana. 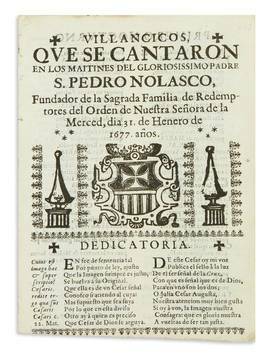 Among the highlights are works such as Juan Navarro’s 1604 Liber in quo quatuor passions Christi Domini continentur, the first music by a New World composer printed in the Americas (Estimate: $8,000-12,000); a 1677 first edition of Mexican poetess Sor Juana Inés de la Cruz’s Villancios que se cantaron en los maitines del gloriosissimo Padre S. Pedro Nolasco, which consists of Christmas carols to be sung in honor of the thirteenth-century saint ($30,00-40,000); and Primera parte del sermonario del tiemp de todo el año, duplicado, en lengua Mexicana, 1614, by Martín de León features sermons intended to be delivered in Nahuatl throughout the year ($20,000-30,000). Manuscripts include a 1529 royal decree from King Charles V protecting the Mexican estate of Hernán Cortés while he was in Spain trying to curry favor with the court ($12,000-18,000), and a volume of manuscript essays by the popular early-twentieth-century poet Amado Nervo ($1,500-2,500). A Texan manuscript diary by William Farrar Smith, documenting the 1849 Whiting-Smith Expedition to form a trail from San Antonio to El Paso, leads a run of material related to Texas with an estimate of $30,000 to $40,000. The dramatic diary marks Smith’s time on the historic expedition with William H.C. Whiting in which he records the difficult terrain and various encounters with Apaches, including the widely feared Chief Gómez. While Whiting’s diary from the trek was published in the early twentieth century, this unpublished record by Smith-a true Wild West saga-is more comprehensive. Also of note is a 1760 first edition of the only early work ever published in the Pakawan language of Texas by Bartholomé Garcia ($8,000-12,000). Additional state-specific material includes the diary of Robert C. Dickey, a prison guard at the Rhode Island State Prison in Providence, in which he writes about the prisoners under his guard and the new warden, General Nelson Viall, and the May 6, 1775 issue of the Virginia Gazette which reports first-hand accounts of the Battles of Lexington and Concord ($1,200-1,800 and $12,000-18,000, respectively). An extensive archive of nearly 100 letters dated August 1862 to April 1865, from Corporal John P. Staples of the 115th New York Infantry to his mother, sister and brother at home in Saratoga County, NY, is featured in an assortment of material relating to the Civil War. The letters relate the movements of the regiment and include reports on the Battles of Crater and Fort Fisher ($5,000-$7,500). Benson Lossing’s Pictorial History of the Civil War of the United States of America, Philadelphia, 1866-68, is present with an estimate of $3,000 to $4,000, as well as a large group of unused patriotic postal covers and stationary featuring printed designs, including one of Major General McCleelan, circa 1861-65, offered at $1,200 to $1,800. Following up on the house’s recent sale of the Holzer collection, quality Lincolniana is set to be offered, including an 1865 oil portrait of Lincoln-a copy of the last rendered from life-by Matthew Henry Wilson (Estimate: $25,000-35,000), as well as two offerings of uncut tintype sheets with photographs of the 16th president which were meant to be used as badges and tokens during the 1860 election ($8,000-12,000 and $6,000-9,000, respectively). Unpublished photos of Al Capone and his henchmen come across the block in a scrapbook compiled by a member of the Untouchables-the famed team responsible from arresting the mob boss. The scrapbook, assembled 1926-33, features eight photographs of Capone and his associates, as well as clippings of news stories reporting on prohibition-related crime, and is expected to bring $5,000 to $7,500. Additional highlights include the first published baseball sheet music, The Baseball Polka, 1858, by J.R. Blodgett, dedicated to the Flour City Base Ball Club of Rochester by the Niagara Base Ball Club of Buffalo ($1,000-1,500). Additional highlights can be found here. Image: Lot 274: Sor Juana Inés de la Cruz, Villancicos que se cantaron en los maitines del gloriosissimo Padre S. Pedro Nolasco, first edition, Mexico, 1677. Estimate $30,000 to $40,000. Hebrew Incunabula and Fine Judaica Coming up at Kestenbaum & Co.